Whether you’re a first-time Provider of Choice or a returning 7-time Leader in Excellence winner, you’re part of a select few. Leader in Excellence winners rank among the top 1% of home care agencies nationwide, and other award winners aren’t far behind. While we do help to promote your awards online, the degree of exposure you get for them in your area ultimately depends on your efforts to promote the awards. If you’ve enabled the free feature on your account, we’ll feature your awards on BestofHomeCare.com, Caring.com, and (coming soon) Carelike.com. It’s up to you to decide how else to promote your awards locally. Used properly, these awards can set your marketing on fire. One Leader in Excellence award winner we spoke to recently commented that 45-50% of their referrals ask about the agency’s Best of Home Care awards when they call. 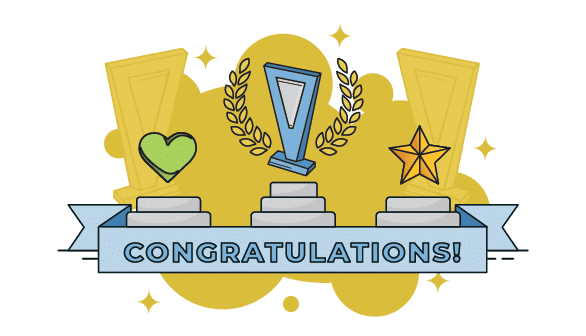 Included with your congratulations email is a marketing kit with instructions for using the awards on social media, sample press release templates you can send out to news outlets, high-resolution award logo files, and other resources. Make the most of this kit! The high-resolution award logos are especially useful as they allow you to use the awards in unique and creative ways in your advertising. The guide in your marketing kit includes dozens of ideas on how you can use the awards. We’ve seen companies do everything from putting award logos in their email signature to using the award logos as decals on the side of their company van. Note: To ensure that the award logos are used properly, please see the Award Use Guidelines in your marketing kit. In addition to the marketing kit, you can purchase customized trophies, plaques, banners, and pins online at this link. Note that while you will only be able to purchase these items for the awards that you’ve qualified for, you can purchase them for any year you’ve won. Make the awards a big deal with your staff. It’s easy to pat yourself on the back as the owner and congratulate yourself for an award well-earned. Make sure to recognize the contributions your staff (caregivers and admin team) have made in helping qualify for this award. The most successful agencies all work to build a culture of recognition. Depending on the circumstances of your agency, this might include a company lunch, gift cards, a small bonus, or something else. Whatever you do, make sure your staff gets to share in celebrating this accomplishment; it not only gives them the credit they deserve but will do wonders in getting them invested in earning the awards again next year. Finally, don’t get too comfortable. Resist the urge to ease off the throttle, and instead double down on what’s made you successful this far. We’ve seen multi-year Leader in Excellence winners lose the award one year because they got too comfortable. You’ve proven that your agency is one of the best available sources of care for seniors in your area—keep it going! Don’t forget that we’ve updated the award criteria for 2019. You can view the new award criteria here. How have you used your awards in marketing? Let us know in the comments below.